Today I have shaved off profits off of SO, T, and VZ. My capital gains were nice on SO and T since I held them long before their long climb up and the flight to high yield. I still hold positions in all 3. These 3 positions I classify as very slow growth and they are great companies but I am overweight in slow positions and I want to take more growth risk as a very young investor. Last week I have done some work categorizing my portfolio into 5 categories. The growth numbers below are averages total returns with dividends reinvested using YTD returns for past years spanning 3, 5, 10, and 20+ years (however far back the data can go) on each of the category's stocks that I have invested. I place more emphasis on more recent 3 5 and 10 year trends. 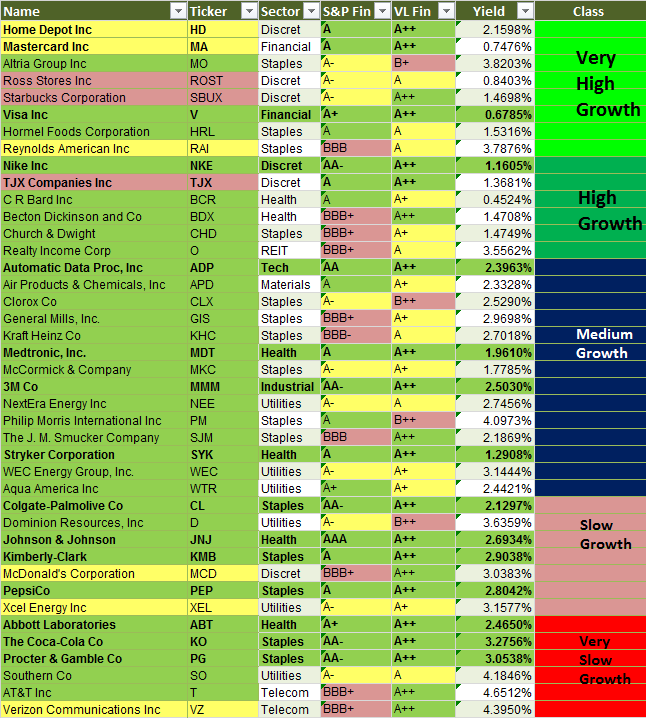 For example, Very high growth represents the group containing (HD, MA, MO, ROST, SBUX, V, HRL, RAI) in my portfolio. Although past performance cannot predict future performance, they do give an idea of which categories certain companies fit under. Additionally companies for the most part continue from the past 3 to 5 years momentum barring an economic disaster. For example AT&T is slow and steady while Ross Stores is a high growth company. 50% will be responsible for growth and 50% will provide the foundation. I took some time to sit down to look at growth trajectories and past performance for my various holdings. I analyzed the EPS growth, dividend growth, cash flow growth, ROIC, and P/E trends relative to past P/E. I grouped my portfolio picks into various names into those 5 categories which I color coded below. Notice that the high growth names are usually those with lower yields and high dividend growth, such as ROST and Visa. Altria (MO) and Realty Income (O) are sort of exceptions since they have produced immense returns while maintaining a high yield. The medium growth are many of your staple dividend growth names but they do not have high yields, many have around 1.5-2.5% yield. The slow growth areas belong to high yielding names that are very stable blue chips. This category holds most of my highest quality blue chips. I find NKE and SBUX undervalued. HD and MA are fairly valued. The others are on the expensive side but appear worthwhile if one is paying up for future earnings. I think MO has actually been undervalued given the recent merger, but time will tell. Great portfolio and great strategy. Keep up the great work!